Dr. Jimmie Weaver, associate professor of chemistry, works to develop chemical catalysts useful to the pharmaceutical industry. Science poster presentations, organized by several OSU colleges and departments during Research Week, are a good way for students to learn to explain their research. The focus of Research Week is to showcase faculty and their scientific, scholarly and artistic explorations, according to Dr. Kenneth Sewell, OSU vice president for research. Research Week also heightens awareness in the community of what is going on at the university, explains Sewell. One of his favorite things about research week at OSU is seeing people reach a better understanding about the importance of research at the university and beyond. The annual celebration also highlights the collaboration of different disciplines across campus. 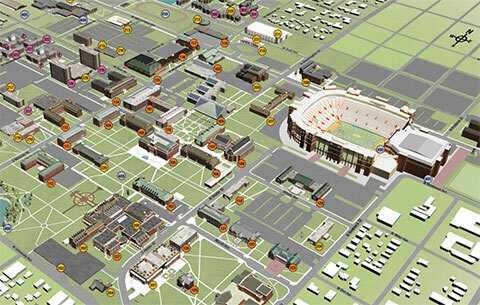 OSU also has a number of research strengths, such as health, plant science, and unmanned aerial systems. One broad interdisciplinary strength involves food, energy and water, and understanding how those fields are linked to each other. He also said there is no way to truly calculate the impact of OSU’s research throughout Oklahoma. However, since OSU is a land-grant university and has a presence in all 77 counties, the knowledge that is developed by OSU researchers has a direct conduit to people across the state. “We strive to help people benefit from all scientific knowledge in practical ways,” Sewell said. For information and a schedule, visit https://researchweek.okstate.edu. Event information is also available on the OSU Research app, which can be downloaded from the App Store or Google Play.